Squash and Statistics - Together at Last! Wimbledon, Euro 2012, The Olympics. The Great British summer of sport has already arrived, but I am sad to say that my sport of choice will not be represented in any of these events. I can't do anything about that, but what I can do is attempt to see where my own game could use some improvement. I regularly play games against my friend Josh (@bain_josh) and most of the time, these games are pretty close. My own gut feeling is that when I win a match, I am overreliant on gaining points when serving. When Josh wins, this doesn't seem to happen. I should add at this stage that you do not need to hold serve to score a point in squash. 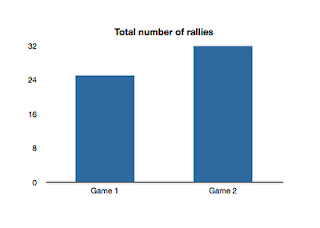 Points are awarded based on who wins a rally. The winner of that rally then goes onto start the next and so on. 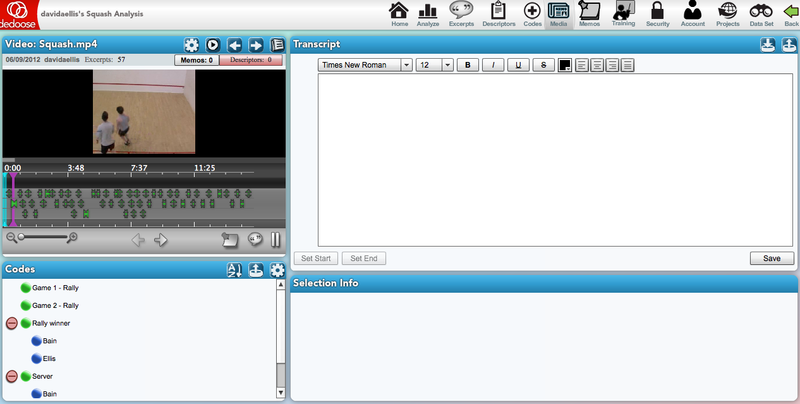 First of all, I added a score tally using iMovie. For reference, I won the first game (15-9) and Josh won the second (15-17). I would argue that the second game is a fairer representation of how close our games normally are. The video below shows some of the best bits - for some reason I called them 'highlights'**. The two videos were then imported into Dedoose for analysis, but even without this some observations jump out almost instantly. The phrase, whoever controls the T (the middle of the court) is in a much better position to win the point, has never been so blindingly obvious. Secondly (as has been suggested to me many times), I do not look behind at what my opponent is doing nearly enough. I start out with good intentions, but slowly drift off and look at the wall instead. Hopefully, Josh will add his own thoughts in the comments section below. All I will say at this stage is that his comeback in the second game and the rest of this match was annoyingly impressive. Another clip exists of me leaning against the wall and appearing to collapse, but I'll save that for another day. Maybe I'll send it into 'You've Been Framed'! The videos were then time stamped and each rally coded based on who won the point and who held serve at the start. These were then tallied and compared. The second game lasted longer overall, although the longest rally actually happened in game number one and went on for just over 30 seconds. Profesional rallies last considerably longer. We are not professionals. 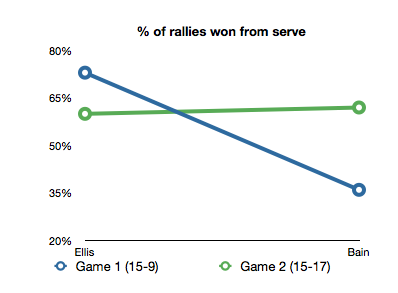 To test my original prediction, which if you remember was: "to what extent do I rely on points from my serve to win the match", I took the number of points won by each player and calculated the percentage of those awarded when they held serve or in other words, when they started the rally. In game 1, 70% of my points came from my serve alone, but this dropped to just under 65% in the second. At the same time, Josh shows a strong trend in the opposite direction. Only 44% of his points came from service in the first game, but this increased to 62% in the second. In statistical terms, this looks like a nice interaction. For those interested in statistics, I ran a number of chi-squared tests to determine if any of these changes were significant. Despite an 18% improvement for Josh between game 1 and game 2, a chi-square test did not reveal a significant change (not a huge surprise given the small sample size). This trend goes someway to explaining what might be going on when our games become extremely close. In game number one, I have a nasty habit of catching Josh out with my serve. Either that or his return of serve sets me up to win the rally. On the other hand, in the second game I am unable to rely on this to the same extent, Josh pushes me into the back corners, and I struggle to win as many points off the back of my serve. At this stage, it isn't clear whether the improvement observed in Josh is due to a better service game from him, a better return of my serve on his part, or a total collapse in my return of serve. That said, I am gaining almost an equal number of percentage points when I start the rally, suggesting that it is my return of serve that has probably deteriorated. Having just watched the second game back it may have also become too predictable? A more detailed analysis would no doubt reveal other significant trends and shed additional light on those questions. A complete analysis my also involve a second person coding the video to ensure inter-rater agreement. Given the infinite amount of information available from the video, the level of analysis could become quite detailed. For example, it might be interesting to consider how efficient Josh and I are at moving around the court based on the average number of steps taken to reach the ball. Alternatively, we might also want to look at how many unforced errors we make. All professional athletes use this sort of data to flag up their own weaknesses. For people who say this all very obvious, it should be noted that there is a big difference between watching something, making casual statements regarding performance and quantifying those behaviours into statistics that support a prediction. Many football commentators are guilty of making casual statements about a specific player or performance without ever looking at the statistics. Commentators who choose to use those statistics are often more interesting with Barry Davies being a good example. *After telling a friend that I was planning to do this, they called me a nerd. **Should have called it something else. Highlights promises too much. ***I now realise that the video camera on my phone might have done a better job than the DV camera I borrowed from the office. **** Asked a few Scottish people this question and they all said, 'about 5 minutes'. Asked some English friends - they had no idea what I was talking about. How many Tweets does it take to make a thesis? Most of my life at the moment consists of writing my thesis, which is fine. I am quite envious of people who can focus on one task for hours on end, but that is rarely me so my writing tends to be quite sporadic. I frequently jump between chapters and keep telling myself that this allows me to get a better feeling for the thesis as a whole. All other written output has suffered, but it won't be forever. I am still semi-engaged with that thing that has become an escape route for batches of 140 characters that are unlikely to ever become something more meaningful. Twitter. But how far would all my Tweets get me in terms of a thesis? I have produced 1,350 Tweets over the last 2 years. Assuming they were all 140 characters long, this would equate to 1350*140 = 189,000 characters. Lets say the average word length is around 5 characters so 189000/5 = 37,800 words. Not bad. To find out a bit more about your own tweets, try tweetstats.com. Unfortunately, there are several problems with this estimate. For a start, a Tweet doesn't always contain 140 characters. The 140 character limit includes spaces and 20% of my Tweets are either re-Tweets or links to other pages. The vast majority also have little to do with my area of research. In other words, the total (useful) word count is likely to be considerably less than 37,800. Taking a more conservative estimate of around 15,000 words, this would still make a nice dent in my thesis, but assuming a doctoral thesis is somewhere between 70 and 90 thousand words, I would need to have at least 4000 original Tweets to get anywhere near that target. Maybe chronic Twitter users should think about that. 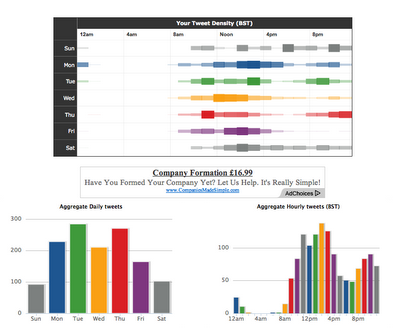 You might be able to get a book (or at least a good idea) out of your Twitter time line! What I need to do now is write a program that will take a Twitter timeline, automatically conduct a thematic analysis and then produce an outline of a thesis based on those findings. Anyone interested in helping out?